References event_Update, UT_Worker::getInstanceData(), m_bAutoUpdate_happening_now, m_bDestroy_says_stopupdating, and UT_ASSERT. References DELETEP, AP_Dialog_WordCount::m_answer, m_bDestroy_says_stopupdating, m_dlg, m_pAutoUpdateWC, XAP_Dialog_Modeless::modeless_cleanup(), and UT_Timer::stop(). Referenced by activate, autoupdateWC, and notifyActiveFrame. 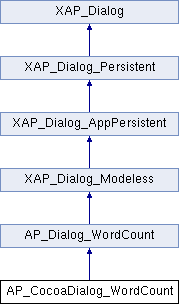 References activate, autoupdateWC, XAP_Dialog::getDialogId(), AP_Dialog_WordCount::localizeDialog(), m_bAutoUpdate_happening_now, m_bDestroy_says_stopupdating, m_dlg, XAP_Dialog::m_pApp, m_pAutoUpdateWC, XAP_Dialog_Modeless::m_pDialog, XAP_App::rememberModelessId(), UT_Timer::set(), and static_constructor. Referenced by autoupdateWC, and runModeless. Referenced by autoupdateWC, destroy, and runModeless. Referenced by activate, destroy, getWidget, and runModeless.